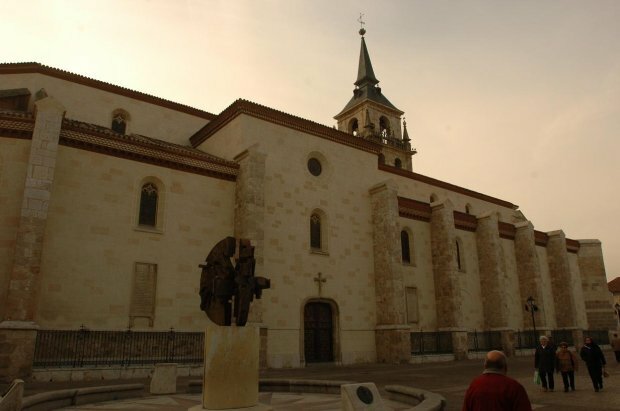 The old Collegiate Church of Saints Justo y Pastor, elevated to the Cathedral in 1991 when the bishopric of Alcalá de Madrid split, is one of the most important monuments of the city because of its history. Although a fire during the Spanish Civil War severely affected the building, the temple, restored in the second half of the twentieth century, retains the beauty of the Gothic style in which it was built. Highlight the title of Magistral that granted him Pope Leo X in 1519. Its origins are located in the Roman past of Alcalá, when in the year 305 AD. Two Complutense children named Just and Pastor were beheaded who refused to adopt the pagan faith. Already at the beginning of the 5th century, the bishop of Toledo Asturio discovered his remains and established a place of worship at the site of the execution. This place of worship would be enlarged with the passage of the centuries and will make the Christian population of Complutum move to its surroundings. In 1099 and after the reconquest of Toledo, the Archbishop obtained Alcalá form part of his diocese, losing its independence until its restoration in 1991. Converted into a parish, the church of Saints Justo and Pastor reached the dignity of Colegiata in 1477 thanks to the Archbishop Carrillo and in 1519 Pope Leo X would grant him the title of Magistral requested by Cisneros and that implied that the members of the Cabildo must have at least the title of Magister (Master in Theology). Cardinal Mendoza first and then Cardinal Cisneros would be responsible for its reconstruction in the form of a Gothic temple to which the cloister, the Chapterhouse and the Chapel of San Pedro in the seventeenth century will be added. Already in the eighteenth century there will be a baroque transformation with the altarpieces and images from the property seized from the Jesuits. At the beginning of the 20th century various modifications were carried out, including the restoration after the fire suffered in 1936, until the last intervention of the 90s that gave it its current appearance.